A competition entry for the entrance to Milan train station, Pancinema is a cylindrical diffuse glass screen on which the daily life of the city is projected at various scales. 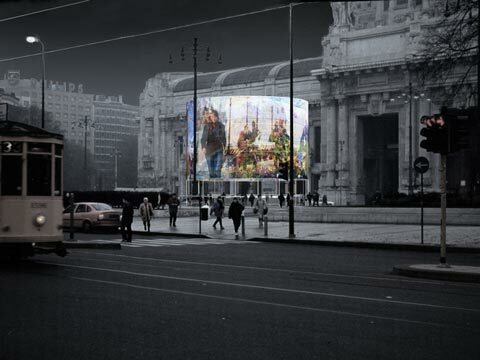 These panoramic image feeds are collaged and shown on a giant glass cylinder in front of milan train station, so forming a memory of the city that starts at the inauguration of the sculpture. 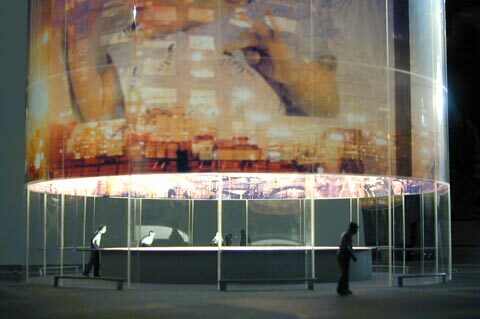 The archived images are played as continuous time-lapse movies on the glass cylinder. The circular balustrade acts as in interface, each section of which marks a period of time past.